This week not only marks the arrival of the fall semester and the return of students to the University of Houston campus but, as mentioned earlier in the week, it also marks the arrival of our newest fellow, Stacey Lavender. As the Houston Arts and History Archives Fellow, Stacey will assist with the processing of archival collections and other tasks associated with the Performing Arts, Houston & Texas History, and Houston Hip Hop collecting areas. I was definitely excited that the position was specifically directed at recent graduates and that I would have the opportunity to work with several different types of collections. I also have just always had the eventual goal of working in a university library and I hadn’t had the opportunity to do that during graduate school. So I thought this would be a really great way to take the skills and knowledge I had from my previous work and educational experiences and learn to use them in a university library setting. A native of the greater Houston area, Stacey joins us from Michigan where she earned her MS in Information from the University of Michigan. While in Ann Arbor she also worked at the U.S. Geological Survey, Great Lakes Science Center, as a Science Records Intern, and as a Student Archivist at the Gerald R. Ford Library in Ann Arbor. Earning her BA in History at Rice, she also has experience as a Records Specialist at the James A. Baker III Institute for Public Policy. We are very excited to welcome Stacey and have her lending her expertise to the UH Special Collections. It’s been a busy few months here in Special Collections. While many Houstonians flocked to beaches and waterparks, researchers beat the heat by spending long hours in our air-conditioned Reading Room. Our team of Librarians and Archivists, meanwhile, buckled down to make more collections available and to update our offerings. A couple of the new finding aids worth checking out are the Houston Hip Hop Recording Artists Collection and the UH Women’s Resource Center Records. And collections incorporating new material into revised finding aids include the Women in the Visual and Literary Arts Records and the Houston Area Women’s Center Photographs. The Special Collections website has also undergone a facelift this summer, with new pages highlighting some of our collecting areas: Architecture & Planning; Contemporary Literature; Hispanic Collections; Houston & Texas History; Performing Arts; and University Archives. We wished farewell this summer to Alison Clemens, our Houston and Texas History Archives Fellow who took a permanent position at Yale University’s Beinecke Rare Book & Manuscript Library. This week, we welcome our new Houston Arts & History Archives Fellow, Stacey Lavender, who comes to us from the University of Michigan. Remember, here in Special Collections we have a number of tools to help with your classwork or research. We collect, preserve, and make available archives, rare books, and other great materials of cultural and historical significance. So if you need to use primary sources, be sure to check us out. Our summer hours (Mon-Fri, 9am-5pm) continue through September 6. On September 7, we’ll start our fall hours, which means we’ll also be open most Saturdays from 12n-4pm. If you plan to visit our Reading Room and aren’t sure when we’re open, you can always check out our hours online. Welcome back to school, Coogs! 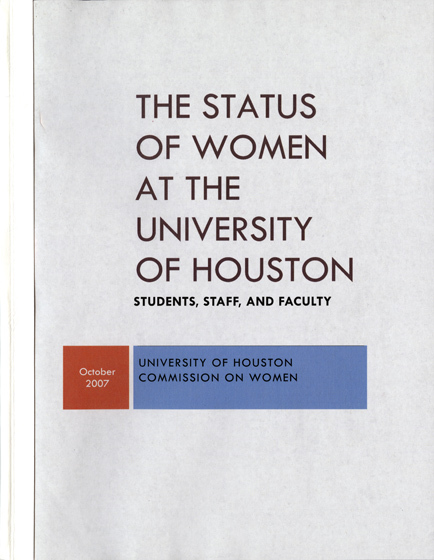 We are pleased to share that the University Women’s Commission Records and University of Houston Women’s Resource Center Records have newly published finding aids in our Carey C. Shuart Women’s Archive and Research Collection. As the University moved into the 21st century, President Arthur K. Smith appointed a commission of 24 UH-affiliated women to study the role of women in the University and address the issues and concerns of women on campus. In time, male voices were added to the Commission and the report emerging at the end of the study suggested a number of recommendations to guide the administration of the University since. 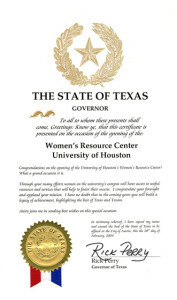 One of the major recommendations, which came to fruition in 2004, was the establishment of the Women’s Resource Center. The University Women’s Commission Records include the expected meeting minutes as well as documents establishing the organization, operational procedures, and priorities of the Commission. In addition, the records outline research and statistics, including surveys, assembled by the Commission, various reports of findings, including executive summaries, as well as materials documenting the establishment of a mentoring program. 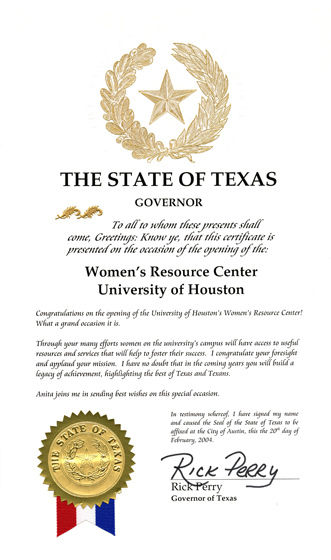 The University of Houston Women’s Resource Center Records provide a glimpse of the Center’s young history of service to the UH community. Materials include correspondence as well as information related to programs and lectures presented by the Center. It will be an informative and telling pleasure to watch this collection grow over time, reflecting the Center and University’s development into the 21st century. Take a “research break” from whatever you’re doing and give these new finding aids a look or, better yet, come see the collections for yourself. For over four decades Dr. Willis Knapp Jones studied, taught, and lectured on the subject of Spanish and other Romance languages. Earning his MA from Penn State University and his PhD from the University of Chicago, Dr. Jones would go on to teach for a short time at Penn State before settling into his career at Miami University in Oxford, Ohio. Throughout, he traveled and taught in Chile, Uruguay, England, and Ecuador. It was during his travels through Latin America that Dr. Jones went about acquiring the breadcrumbs of numerous, visually stunning, theatre programs (dating from the late 1930s through the early 1960s) and an even larger library of original plays, including rare and unpublished titles, and critical works related to the study of Latin American theatre. After his “retirement” in 1963, he published Beyond Spanish American Footlights, a seminal English-language study of the history of Latin American theatre. 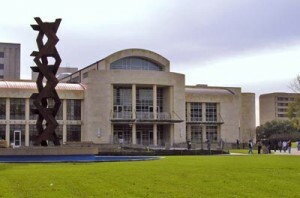 When Dr. Jones retired, the University of Houston Special Collections acquired his library related to Latin American theatre. 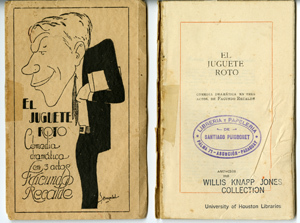 These materials include the previously mentioned programs making up the Willis Knapp Jones Latin American Theatre Programs collection as well as over 1,000 volumes Dr. Jones acquired over the years, constituting the Jones Latin American Drama Collection. Researchers with an interest in our Performing Arts collections will certainly want to take a look at these programs and texts. 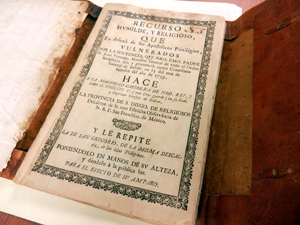 In addition, given Dr. Jones’s analysis of theatre as a barometer of the social mores, political leanings, and history of a nation, the resources from his library may also serve to complement scholars interested in visiting us to conduct research in our growing Hispanic Collections. When you have a moment, do look through the detailed finding aid for the Latin American Theatre Programs or peruse the catalog of plays and come take advantage of these incredibly rich and rare resources. As part of our Hispanic Collections, the Mexico Documents Collection is a small assortment of documents related to the government and people of Mexico, sure to provide some interesting research. The collection was assembled from another, larger collection of manuscripts and is available for study thanks to the generosity of a handful of donors. Given the variety of the collection’s sources, what has emerged is a potpourri of papers dating back as far as 1570, running through the Texas Revolution, the Mexican-American War of 1846-1848, and extending as far forward as 1898. 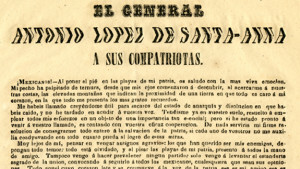 The documents run the gamut from dealing with the administration of states and territories such as Tamaulipas to communiqués and decrees from Antonio López de Santa Anna. Researchers and scholars with fluency in Spanish should find these materials wholly approachable. However, for those whose Spanish may be limited, English translations are available for many of the documents. Information regarding provenance, when known, has also been included alongside the materials. 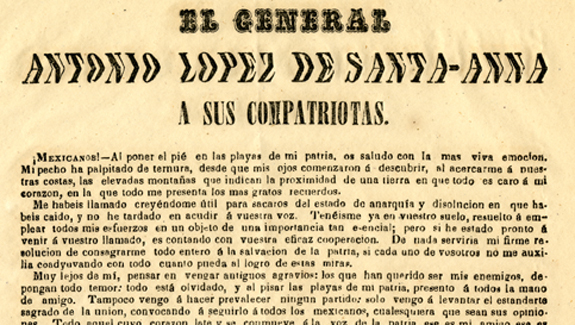 A detailed finding aid for the Mexico Documents Collection is available online and the collection itself remains open and available for study in the Special Collections Reading Room, at the University of Houston. No appointment is necessary and we look forward to assisting you with your research when you are ready to visit us.